The Scottish nurse who contracted Ebola while volunteering in west Africa has been named as Pauline Cafferkey, the first person to be diagnosed with the virus on UK soil. Cafferkey arrived in London for specialist treatment on Tuesday morning after being transferred by military aircraft from hospital in Glasgow. The healthcare worker had asked Save the Children, the charity she was volunteering with in Sierra Leone, not to name her but her identity has been reported widely. Her identity was released as David Cameron sought to allay public concern over the virus as he chaired an emergency Cobra meeting on the latest patient. “Safety measures are working well – and the risk to the public is extremely low,” the prime minister said. Cafferkey becomes the second Ebola patient to be treated in the UK after the British nurse William Pooley, who contracted the virus last August. Pooley was successfully treated at the Royal Free hospital, in north London, where Cafferkey is undergoing treatment. A nurse for 16 years and originally from Fife, Cafferkey was based in Blantyre, South Lanarkshire, and was one of 30 NHS volunteers to help treat Ebola victims at specialist hospitals in Sierra Leone in November. She worked in the highly infectious “red zone” near Freetown and wrote in a diary for the Scotsman how she was inspired to become a health worker after seeing images of the Ethiopian famine in the 1980s. Cafferkey was one of 30 NHS volunteers to fly from Sierra Leone to Heathrow airport via Casablanca in Morocco on Sunday, before she flew on to Glasgow. 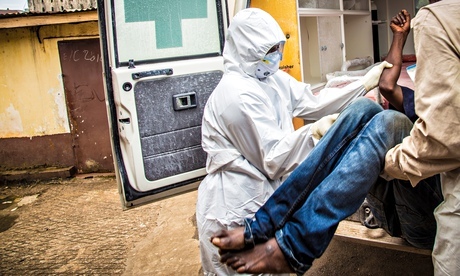 A doctor who sat next to Cafferkey on the flight from Sierra Leone told the Guardian that Public Health England were risking public safety with their “utterly illogical” quarantine rules. Dr Martin Deahl said it was “bizarre” that volunteers like himself and Cafferkey were allowed to catch onward domestic flights in the UK once landing at Heathrow – but once they are at home they are told not to take public transport or enter crowded places. “The ridiculous thing about this is the advice says once we are home we shouldn’t use public transport or go into crowded places, or if we do it should just be for short journeys of less than an hour, and yet they were quite happy to let us go home disperse from UK airports on the underground, on flights to Glasgow, which just makes a complete mockery of the quarantine arrangements,” Deahl said. He described the scenes at Freetown airport, where up to 30 volunteers who had met to travel back to the UK said goodbye ,“kissing and hugging” one another – including the nurse. Ebola is not contagious before patients develop symptoms, and the health authorities in Scotland have confirmed that the nurse had none until she arrived home from her journey. Deahl also criticised the “totally inadequate” facilities for testing at-risk health workers once they landed at Heathrow airport, which he said increased the chances of cross-infection. He said nurses were herded into several overcrowded “tiny poky little offices” and had to wait up to an hour to be checked over. The temperature testing kits that health workers are given to take home had run out by the time he got seen, Deahl said. “The facilities for doing temperatures and the suite of rooms they were using were totally inadequate for the numbers coming through,” he said. Health officials are trying to trace the 71 passengers on Cafferkey’s internal British Airways flight – BA1478 – from Heathrow to Glasgow. Nicola Sturgeon, the Scottish first minister and previously Scottish health secretary, said on Monday the search for passengers was a precautionary measure. The nurse, who is believed to be at the early stages of the infection, had been cleared by screening in Sierra Leone and at Heathrow. A senior Public Health England official also said the risk of Ebola spreading from the nurse was extremely low but further checks were being carried out as a precaution. Prof Paul Cosford, the medical director of Public Health England, said the authorities were confident the nurse has been successfully isolated and her clinical care was going as expected. However, he said passengers who had sat with her on flights into the UK and from London to Glasgow would want to be reassured by contact with doctors. He assessed the risk of transmission as extremely low outside of the hospital environment where she is being cared for in London. Posted on 30th December 2014 by newsafrica. This entry was posted in Africa, Ebola, Health, Sierra Leone. Bookmark the permalink.